We love X3D. Be inspired by actual studies, small demos, and experiments, accessible on our SVN Server. Have a look on best practices and how-to's when working with X3D and the instant reality framework. You can do this of course with arbitrary hardware (think of the LEAP support or the Kinect), but please bear in mind that this is only a preview at the moment. Checkout another example and see, how to use the integrated Fraunhofer IIS – SHORE FaceDetector inside the instantreality Framework. These examples demonstrate the features of the new CommonSurfaceShader node. Included are examples for normal mapping, the perfect specular component, and an example of a scene exported from 3ds max. The new Geospatial-Examples demostrate the support for X3D’s Geospatial component in InstantReality. 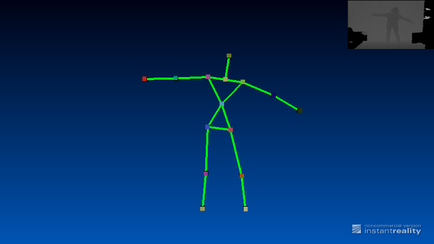 This example in our SVN repository shows how a hooked up Kinect device can be used to track a user skeleton. The new NI InstantIO node provides the input data which is converted to a small stick figure. To get going, simply stand in front of the camera and hold your arms up to form a Psi pose. This will trigger the user calibration, which after a successful run, will allow the skeleton tracker to run properly. 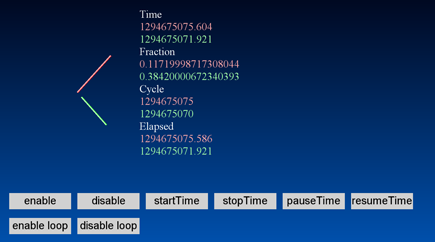 Experimenal example, downloadable from our SVN with the intention of understanding the X3D spec about timers. We have added a little example, which shows how to use QT-Widgets as an interactive Texture inside X3D Scenes, to our example SVN. Little example for animating content of a ParticleSet, down-loadable from our SVN. This example was created in a way that it loads an image and for that parametrize the structure of the particle set. For that, you can change the input image to anything you like. Inside a fraction_changed event the z-value and the alpha blending of each particle is animated by sin & random functions.